I feel honored to be a part of the WordPress 101 Blogging University project. My name is Rick London and I am a 60 year old autistic author, songwriter, cartoonist and gift designer. I am married to my best friend @LeeHillerLondon (who will also be taking the class) as well as the Branding 101 class of which I hope to be a part. I mention the autism as I was not diagnosed until age 60, about 3 months ago. I have much to learn about writing, though I’ve been doing it for about 32 years. I guess I am best known for launching Londons Times Cartoons (LTCartoons.com) in an abandoned tin shed in rural Mississippi in 1997. It became Google’s #1 ranked offbeat cartoons and offbeat cartoon gifts, a ranking it has held since January of 2005. 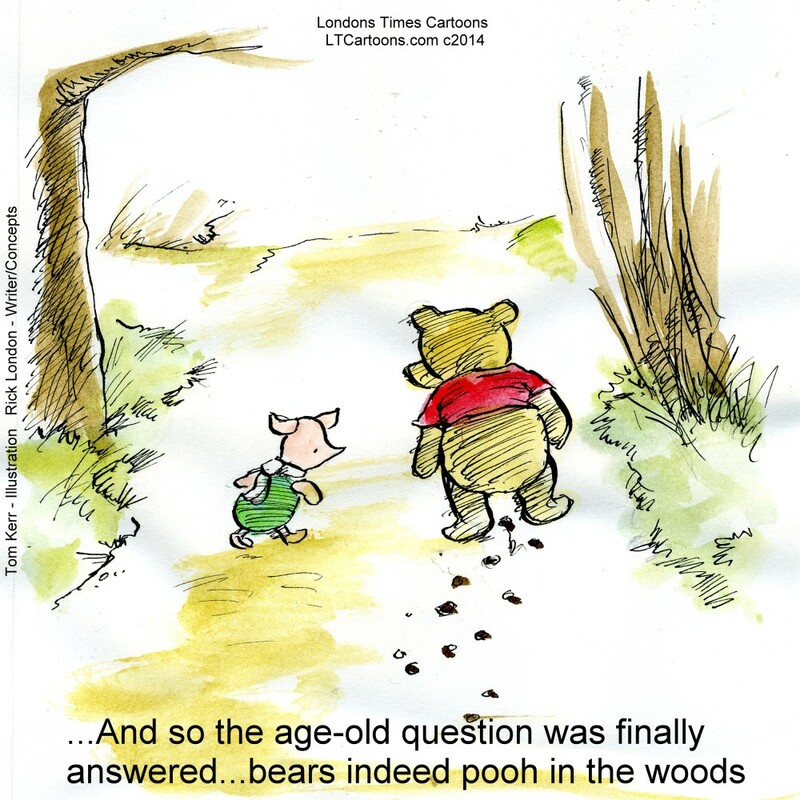 I have published about 4500 cartoons but written many more than that. It is a team effort. I create the concepts, write the cartoons, and assign them to one of my three team illustrators. I then design the gift items digitally. Finally, I have decided to go public, just this year, with the fact that I was a neglected/abused autistic child, never diagnosed, but obviously very different, and hidden away, isolated from my other two siblings in an attic bedroom. I was scapegoated. I am public not for sympathy, but because I now know how prevalent such family dynamics are, and I’ve already been told in my last few months of blogging about it, that my story has helped several families. I have written all kinds of “flights of fancy” and slayed some dragons. It was my wife’s idea to “get back to basics”, and this seems the perfect place to do so. When I’m back to basics I am centered, and open to learn. And I hope to accomplish those things. Thank you. Last Friday Lee looked at the weather channel webpage and saw that snow and sleet was about to rear its ugly head in south-central Arkansas (that’s where we are). For her, that meant a short solo hike yesterday in search of exotic birds that seem to land and stay awhile whenever we have one of these storms (and she got a beauty of a closeup video of cedar waxwings). If you’ve not seen it, please do yourself a favor. http://hikeourplanet.com. For me, it meant changing my physical therapy appointment (for arm and back injury) from Monday to another day, which I did (on Friday). So yesterday I got a call from the physical therapy office. The voice on my voicemail said, “We’re going to have to postpone your appointment due to weather conditions”. I thought to myself, “I wish when I worked in corporate America we could have had such a laissez–faire attitude towards our work (in other words, not do it but get paid). Alas those were the days of responsibility and duty. Today are the days of “I’ll get to it when/if I can”. So I called back in a huff letting them know I’d already called on Friday, aware of the upcoming bad weather, and already changed my appointment which obviously was not recorded. I’ve not heard back. So what is my point? Well my injury, and rest-assured, I don’t do things half-baked….this is a full-blown killer pain starting at my fingers and moving its way back and forth to my upper and lower back. I’ve had some interesting injuries in the past, but this one by far is the worse. So again, what’s my point? I wondered how in the hell I’d be able to type a blog…..and there ya have it…..a blog! By the way, Lee is helping me with my exercises, and I go to physical therapy tomorrow…that is if they remembered to post the appointment. Even though I’ve been at this SEO (search engine optimization)/social media stuff for maybe 8 or so years now, and blogging is a major part of it, I really have to be in the mood to blog….and I’m rarely in the mood to blog. So this is very special…I mean this blog…is very special. Don’t you feel honored? I know I do….and I thought you would. I feel so special writing it. I feel so facetious writing this part of it. They say before starting a blog, have a vision, a goal and a purpose of the blog. I have none of the three. Does that mean I stop the blog? Not really. I’ll keep writing but only reluctantly. Since I write cartoons and design products featuring those cartoons, I’ll write about that. (They say “Write what you know”). 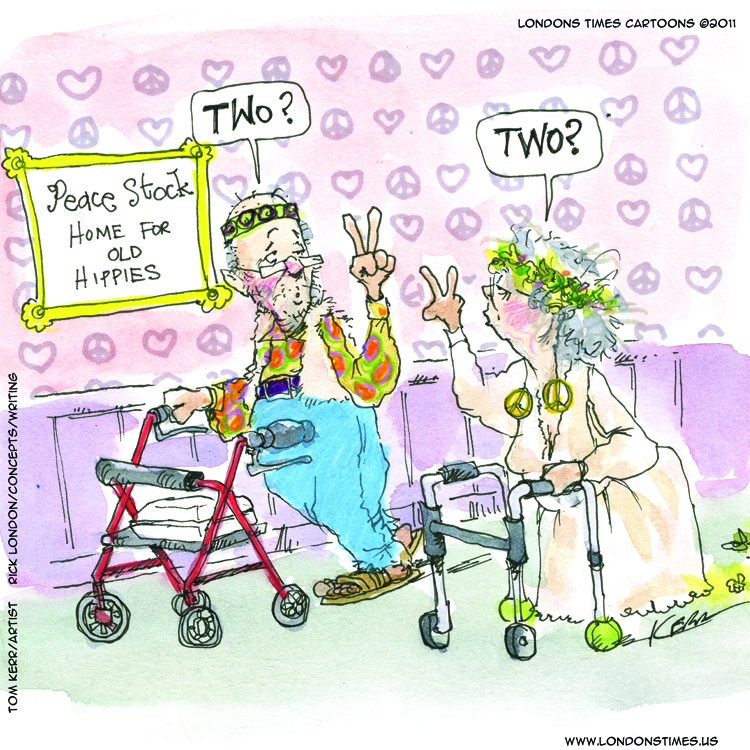 The funny thing is, this March 19th, Londons Times Cartoons will be 18 years old (or LTCartoons) as we now like to call it since nobody pronounces “Londons Times” correctly (including me). My RickLondonGifts.com turns 9 years old sometimes this year but for the life of me I cannot remember the date so I celebrate it all on March 19th. One neat thing. I’m in the middle of writing a book titled “Useless Quotes And Funny Cartoons” which will be released by March 19th. I think it’s neat to do something for anniversaries. My beloved wife Lee and I went out to Garvin Woodland Gardens for our last anniversary and I imagine we’ll do something for this one too. Both of us are sort of homebodies though. I mean we like to get out and mingle with the townsfolk but I’d have to say our favorite “social event” is shopping at our smaller Kroger’s where “Everybody knows our name” and we sit and chat with all the happy Kroger employees, and they are quite happy. They get paid well. At the risk of sounding political, one would be hard-pressed to find a happy soul at the Wal-mart just around the corner from Kroger. However they just raised the minimum wage several dollars so this might change the attitude of Wal-Mart. We buy our dry-goods there; but the organic and/or vegan selection is best at Kroger. Wal-Mart did make a promise several years ago on network news that they would have an organic/vegan department in most their stores and low and behold they followed up on their promise. Sam would be proud. Oh good. I just thought of my goal, my vision, my reason for this blog; even though it’s almost over now. Why do I work hard (and I do) at age 60 creating new gifts and collectibles of our images? The answer is not black and white nor easy to explain, but I can only say it is part of maybe being empathetic to other shoppers. I know a lot of people, who, are sort of like me. That is they like to find unique hand crafted/designed products at reasonable prices on the net that they know absolutely they cannot and will not find at their local mall. Those are my products. Lee’s are the same. We do allow Sears to sell them but only at their online store. Same with Amazon, Cafepress, Zazzle, Red Bubble, Oarttee, etc. There may come a day that we go 3-D retail establishments, and I imagine there is more money in it, but by keeping it online, we give people a chance to explore and find. Eureka. But until that time comes, we’ve managed to offer some of the most unique and highly rated gifts and collectibles on the net. My offbeat cartoons and gifts are recognized as Google and Bing #1 ranked and have been every year since 2005. If I spread myself too thin, I can’t guarantee I can keep that level of quality or recognition (though I would do everything possible to try). Meantime, the way I see it, I’ll fall off that bridge when I get to it. Little things happen all the time that make me glad to be selling and creating online rather than at a physical store. For instance recently my CafePress funny tees & gift shop RickLondonCartoons.com added an Amazon checkout (Lee has one at her shop there as well). This is big, as most online shoppers love their Amazon accounts, and though we have plenty of items at Amazon, we have others at CafePress that can’t be found at Amazon, but can be checked out there. Now I’m rambling, but expressing some of the good things about why I spend most of my time working on the Internet. Why not? Rick London is a writer, songwriter, cartoonist, and designer living in the Ouachita Mountains of Arkansas. 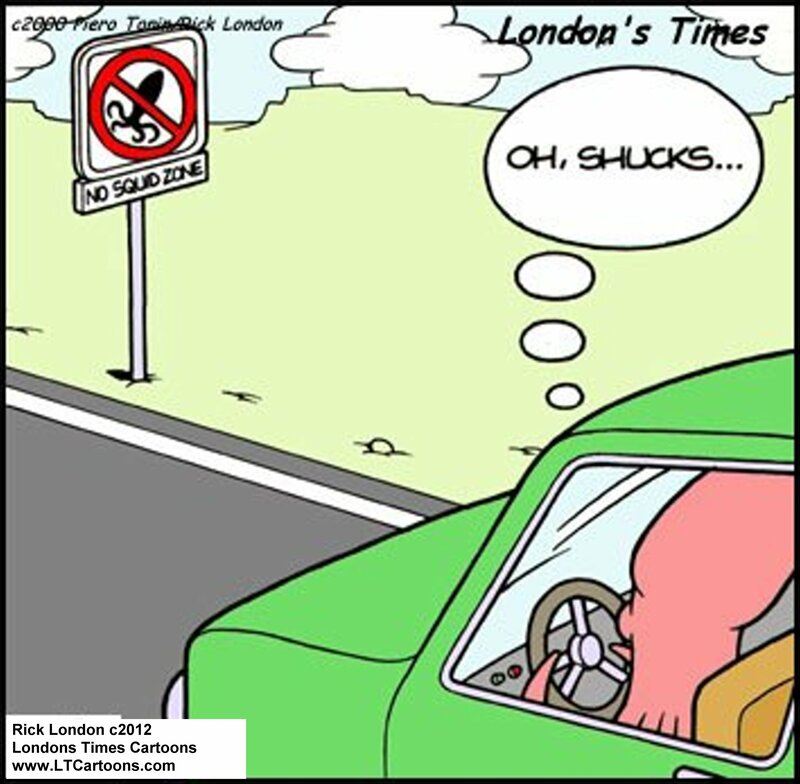 He is best known for launching Google’s #1 ranked offbeat cartoons & funny gifts “Londons Times”. He is married to nature/wildlife photographer Lee Hiller-London who has the popular nature blog Hike Our Planet.